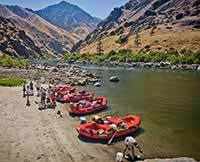 Out of all the whitewater rafting trips I have done with Western River Expeditions this Snake River rafting trip had the best rapids and wildlife. As usual, the guides were awesome and the food was excellent. We had a great time once again.